One of our biggest design challenges of the Billiard Room for Christmas at Callanwolde was the mantle. We have been planning this space for months and had many ideas but it was not until the install that it fully came together. Not only is the mantle stunning by itself, we certainly did not want to hide it, but it’s height is six feet so we knew that small trinkets would not do! We started with the beautiful deer painting by Susan Easton Burns and wooden trees to frame it. We then used a live garland and added magnolia leaves and buds from the garden for texture and volume. The finishing touch was the lights, this sounds simple but in fact the process took hours! A few secrets: we placed two of the trees on a wooden blocks (hidden in the garland) for height, store bought live garland made a great base for greenery and we used plenty of wire to keep each piece in place. This is our handsome result! Had we kept going I predict our mantle would look more like this. This garland is so full and beautiful I can not imagine how long this took. The finishing touch that I find so interesting is the feathers. The wreath and vases with more greenery give great height and it would not be complete without lights. This simple mantle is just my style! I would start with the candle sticks and fill in with greens and since nothing hangs down this could be assembled quite easily. 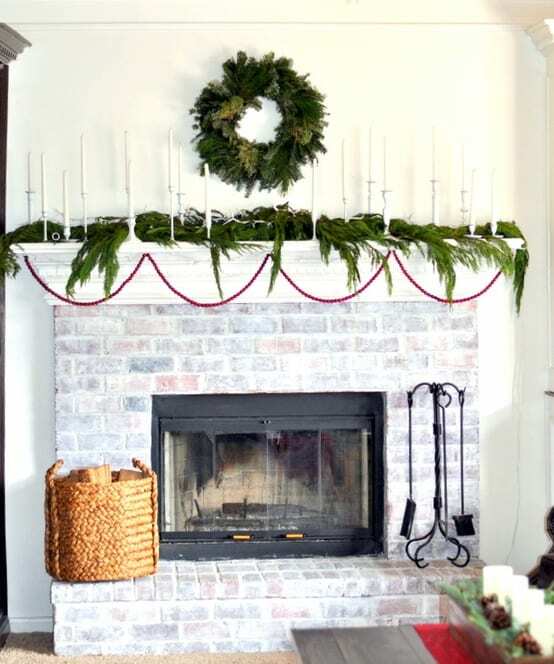 The string of cranberries are a great touch and the wreath above is as wonderfully simple as the mantle. Overall this seems very manageable and customizable for any style. Now for another full mantle top, designed by Tobi Fairley. This design has a variety of greenery and the citrus fruits are a fun non-traditional addition. Since the focus in on the natural elements, keeping the urns simple was the right choice. In this space the focus is not so much on the mantle but the decor surrounding the mantle. The decorated topiaries make a festive statement and the mantle has a few simple trees. My favorite part? The bundle of pine trimmings hanging from the ceiling! This is an interesting modern country living space, wonderfully decorated for Christmas. The color palette is traditional Christmas, red, green and white while the style is rustic with the burlap runner, pine cones on the mantle and simple floral. The picnic basket, suitcase and present are a fun focal point in the fireplace and the mismatched stockings are waiting to be filled! I love pom poms! This is one of the best images I have ever seen of a whimsical Christmas mantle. The reason I think it is so wonderful that the pom pom garland is the only color, the simple white stockings allow the garland to be the superstar. Although the mantle of our show house did not come together until the end, it is of course the focal point of the room. I hope everyone has as much fun decorating this season as we did and if you do not have a mantle, a shelf or chest is a great place to go crazy with Christmas. Visit us at Nandina Home & Design for lots more great ideas for your holiday decor!